Your college pillow sham should provide you with a comfortable place to lay your head on your dorm room bed. 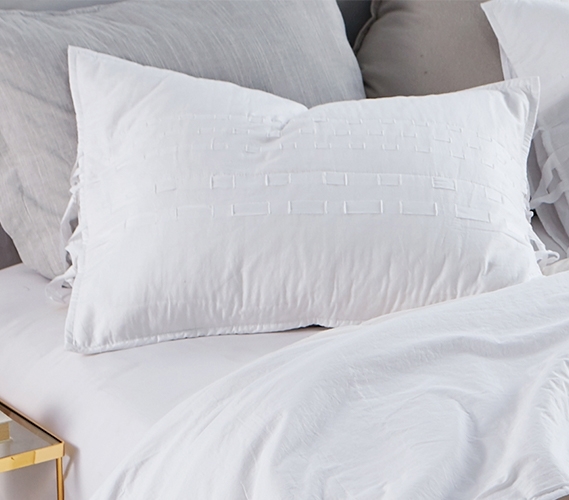 Since a dorm sham is so important we understand if you want it to be extra cozy. Fortunately, our DIY Threads Textured Sham (2-Pack) delivers that must have Twin XL bedding comfort! Made with 100% soft to the touch cotton, these college shams will add comfort to your extra long Twin size bed. And this white dorm standard size pillow sham can also add to the style of your dorm room. We know you see a white college pillow sham when you look at your screen, but these essential dorm pillow shams for your Twin XL sized bed have a surprise for you. You can keep this college sham white or you can customize it to fit your style! The threaded designed of these dorm pillow shams lets you easily add in your own colored threads to make your dorm bed one-of-a-kind. Choose whatever color you want and thread it through these unique standard size college shams and you have a colorful and stylish Twin extra long bed that is all your own.